This classic lasagna is made with Italian sausage, tomato sauce, ricotta, and mozzarella cheese. It's super easy and is always a hit with family and friends. Use a sweet or mild Italian sausage in the recipe. For a spicier lasagna, use hot Italian sausage. Feel free to make the lasagna with ground beef or ground turkey if you'd like. 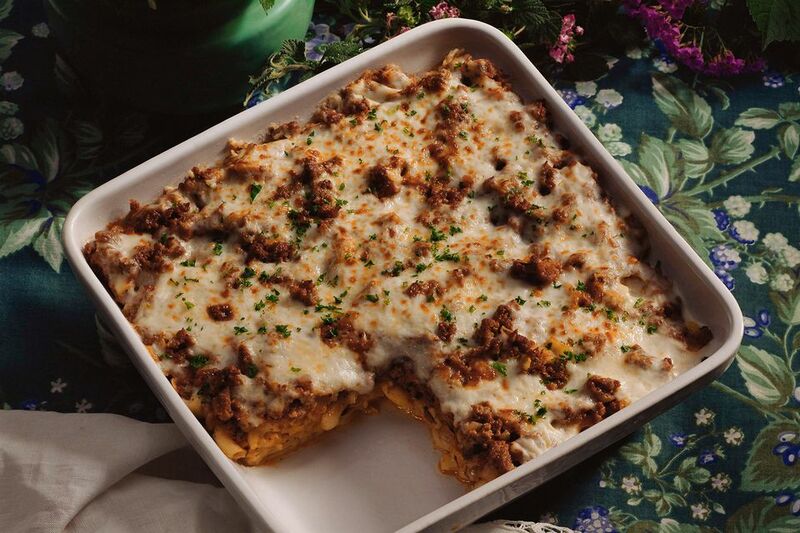 This type of lasagna originated in Southern Italy and Naples. It was brought to America with Italian immigrants and became a staple at Italian-American restaurants. You can enjoy this hearty pasta to feed a hungry family. Serve it with a green salad to start and some steamed vegetables on the side. It goes great with a glass of good red wine for a lovely traditional Italian dinner. In a skillet, brown the sausage slowly; drain off excess fat. Add the garlic, tomatoes, basil, oregano, 1 1/2 teaspoons salt, and tomato paste. Simmer, uncovered, for 30 minutes, adding a little water if it gets too thick. In a large pot, bring salted water to a boil. Add the lasagna noodles and cook according tot he package directions. In a bowl, combine the ricotta cheese, Parmesan cheese, parsley, eggs, 1 teaspoon salt, and pepper. In the bottom of a 9-by-13-by-2-inch baking pan or lasagna pan, place one layer of the noodles. Cover the noodle layer with a layer of mozzarella cheese and then spoon half of the ricotta mixture over the mozzarella. Spoon half of the meat sauce over the ricotta cheese layer. Repeat the layers (starting with the noodles), ending with mozzarella cheese. Bake for 30 to 40 minutes in a 375 F oven. Remove the lasagna from the oven and allow it to set a few minutes before serving. Cover and refrigerate any leftovers. The good news is that leftover lasagna continues to get better tasting as the flavors blend. You can reheat servings in the microwave and enjoy it for three to five days. To save servings for even longer, freeze them in airtight containers. They will be best if used from the freezer in two to three months, but are safe to use beyond that time. For convenience, you can use a large jar of spaghetti sauce or marinara in place of the tomatoes, basil, oregano, salt, and tomato paste. Add more vegetables. Saute 1/2 cup of chopped onion and 1/4 cup of chopped bell pepper with the Italian sausage. Or, add a package of frozen chopped spinach (defrosted and well-drained) or a cup of grated carrots to the meat sauce.